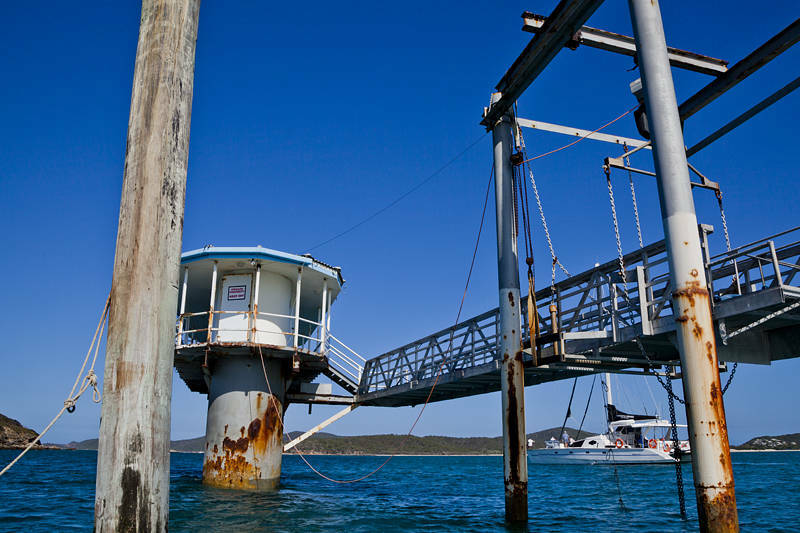 This is the Middle Island Underwater Observatory off the coast of Queensland, Australia. It was refurbished and re-opened in 2007 so visitors could descend six metres below sea level to view coral and fish including honeycomb cod, flowery cod, damsel fish, moon wrasse and gropers. It looked as if it had been abandoned again when this photograph was taken in 2016. Rather sad, especially for those who don’t want to go scuba diving. Is it a victim of bleached coral reducing the number of species or simply a reduction in tourism? I read that a decision about its future will be made in November. Tourism has reduced. The main island was a party destination until cheap flights to Bali became popular and the resort closed. Now goats and trees have overtaken the buildings. There is still some coral down there. Being the southern cold end of the Barrier Reef I expected to see more growth. Pollution can be just as damaging as sea temperatures when it comes to coral bleaching.